In scientific notation, it is written as 1 × 109. Previously in British English (but not in American English), the word "billion" referred exclusively to a million millions (1,000,000,000,000). However, this is no longer as common as earlier, and the word has been used to mean one thousand million (1,000,000,000) for some time. The alternative term "one thousand million" is mainly used in the U.K., or countries such as Spain that uses "one thousand million" as one million million constitutes a billion. The worded figure, as opposed to the numerical figure (one thousand million/$1,000,000,000) is used to differentiate between "one thousand million" or "one billion". The term milliard can also be used to refer to 1,000,000,000; whereas "milliard" is seldom used in English, variations on this name often appear in other languages (e.g. Slovenian Miljarda, Hungarian (Magyar) milliárd, Indonesian miliar, Polish miliard, Danish milliard, Spanish millardo, French milliard, Italian miliardo, Icelandic milljarður, German Milliarde, Hebrew מיליארד, Finnish miljardi, Dutch miljard, Croatian milijarda, Serbian милијарда, Bulgarian милиард, Russian миллиард, Czech miliarda, Arabic مليار, Romanian miliard, Swedish miljard, Norwegian milliard, Turkish milyar, Esperanto miliardo). The SI prefix giga indicates 1,000,000,000 times the base unit. Despite this, B remains the common abbreviation for this number. See Orders of magnitude (numbers) for larger numbers; and long and short scales. 1000000007 – smallest prime number with 10 digits. 1023456789 – smallest pandigital number in base 10. 1026753849 – smallest pandigital square that includes 0. 1073676287 – 15th Carol number. 1073807359 – 14th Kynea number. 1129760415 – 23rd Motzkin number. 1134903170 – 45th Fibonacci number. 1234567890 – pandigital number with the digits in order. 1311738121 – 25th Pell number. 1382958545 – 15th Bell number. 1406818759 – 30th Wedderburn–Etherington number. 1836311903 – 46th Fibonacci number. 1882341361 – The least prime whose reversal is both square (403912) and triangular (triangular of 57121). 2147483647 – 8th Mersenne prime and the largest signed 32-bit integer. 2214502422 – 6th primary pseudoperfect number. 2971215073 – 11th Fibonacci prime (47th Fibonacci number). 3166815962 – 26th Pell number. 3192727797 – 24th Motzkin number. 3323236238 – 31st Wedderburn–Etherington number. 3405691582 – hexadecimal CAFEBABE; used as a placeholder in programming. 3405697037 – hexadecimal CAFED00D; used as a placeholder in programming. 3735928559 – hexadecimal DEADBEEF; used as a placeholder in programming. 4294836223 – 16th Carol number. 4294967291 – Largest prime 32-bit unsigned integer. 4294967295 – Maximum 32-bit unsigned integer (FFFFFFFF16), perfect totient number, product of the five prime Fermat numbers..
4294967297 – the first composite Fermat number. 4295098367 – 15th Kynea number. 4807526976 – 48th Fibonacci number. 5784634181 – 13th alternating factorial. 6210001000 – only self-descriptive number in base 10. 7645370045 – 27th Pell number. 7778742049 – 49th Fibonacci number. 7862958391 – 32nd Wedderburn–Etherington number. 8589869056 – 6th perfect number. 9043402501 – 25th Motzkin number. 9814072356 – largest square pandigital number, largest pandigital pure power. 9876543210 – largest number without redundant digits. 9999999967 – greatest prime number with 10 digits. 109 metres (called a gigameter) is almost three times the distance from the Earth to the Moon. 109 kilometres is over six times the distance from the Earth to the Sun. The possession of assets with total value of 109 United States dollars would place a person among the world's wealthiest individuals. There are a billion cubic millimeters in a cubic meter and there are a billion cubic meters in a cubic kilometer. As of July 2016, Apple has sold one billion iPhones. This makes the iPhone one of the most successful product lines in history, surpassing the Sony Playstation and the Rubik's Cube. A small mountain, slightly larger than Stone Mountain Georgia, United States, would weigh (have a mass of) a billion tons. There are billions of worker ants in the largest ant colony in the world, which covers 4,000 miles of the Mediterranean coast. 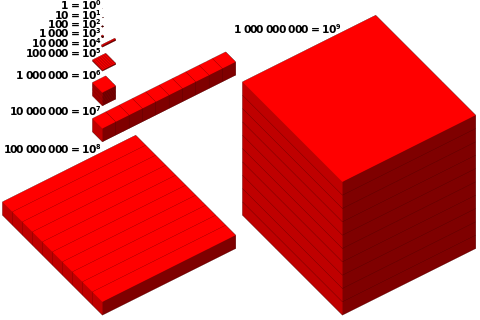 A is a cube; B consists of 1000 cubes of type A, C consists of 1000 Bs; and D consists of 1000 Cs. Thus there are 1 million As in C; and 1,000,000,000 As in D.
↑ "figures". The Economist Style Guide (11th ed.). The Economist. 2015. ↑ "6.5 Abbreviating 'million' and 'billion'". English Style Guide. A handbook for authors and translators in the European Commission (PDF) (8th ed.). 5 October 2016. p. 31. ↑ "How many is a billion?". oxforddictionaries.com. 1 2 "Sloane's A093112 : a(n) = (2^n-1)^2 - 2". The On-Line Encyclopedia of Integer Sequences. OEIS Foundation. Retrieved 2016-06-18. 1 2 "Sloane's A093069 : a(n) = (2^n + 1)^2 - 2". The On-Line Encyclopedia of Integer Sequences. OEIS Foundation. Retrieved 2016-06-18. 1 2 3 "Sloane's A001006 : Motzkin numbers". The On-Line Encyclopedia of Integer Sequences. OEIS Foundation. Retrieved 2016-06-18. 1 2 3 "Sloane's A000129 : Pell numbers". The On-Line Encyclopedia of Integer Sequences. OEIS Foundation. Retrieved 2016-06-18. ↑ "Sloane's A000110 : Bell or exponential numbers". The On-Line Encyclopedia of Integer Sequences. OEIS Foundation. Retrieved 2016-06-18. 1 2 3 "Sloane's A001190 : Wedderburn-Etherington numbers". The On-Line Encyclopedia of Integer Sequences. OEIS Foundation. Retrieved 2016-06-18. ↑ "Sloane's A054377 : Primary pseudoperfect numbers". The On-Line Encyclopedia of Integer Sequences. OEIS Foundation. Retrieved 2016-06-18. ↑ "Sloane's A005165 : Alternating factorials". The On-Line Encyclopedia of Integer Sequences. OEIS Foundation. Retrieved 2016-06-18. ↑ "Sloane's A004490 : Colossally abundant numbers". The On-Line Encyclopedia of Integer Sequences. OEIS Foundation. Retrieved 2016-06-18. ↑ "Sloane's A002201 : Superior highly composite numbers". The On-Line Encyclopedia of Integer Sequences. OEIS Foundation. Retrieved 2016-06-18. ↑ "Sloane's A000396 : Perfect numbers". The On-Line Encyclopedia of Integer Sequences. OEIS Foundation. Retrieved 2016-06-18. ↑ "greatest prime number with 10 digits". Wolfram Alpha. Retrieved July 15, 2014. ↑ "How much is a billion?". Math Forum. Retrieved 8 May 2015. ↑ "Cosmic Detectives". The European Space Agency (ESA). 2013-04-02. Retrieved 2013-05-01. ↑ Panken, Eli (27 July 2016). "Apple Announces It Has Sold One Billion iPhones". NBC News. Retrieved 28 July 2016. ↑ Seethamaram, Deep (27 July 2016). "Facebook Posts Strong Profit and Revenue Growth". Wall Street Journal. Retrieved 28 July 2016. ↑ Burke, Jeremy. "How the World Became A Giant Ant Colony". Atlas Obscura. Retrieved 28 July 2016.